Read the text of Uncle Tom’s Cabin HERE as originally released in The National Era. You will find each chapter, followed by commentary, and links to Stowe’s A Key to Uncle Tom’s Cabin and related materials. Harriet Beecher Stowe (1811-1896) published more than 30 books, but it was her best-selling anti-slavery novel Uncle Tom’s Cabin that catapulted her to international celebrity and secured her place in history. 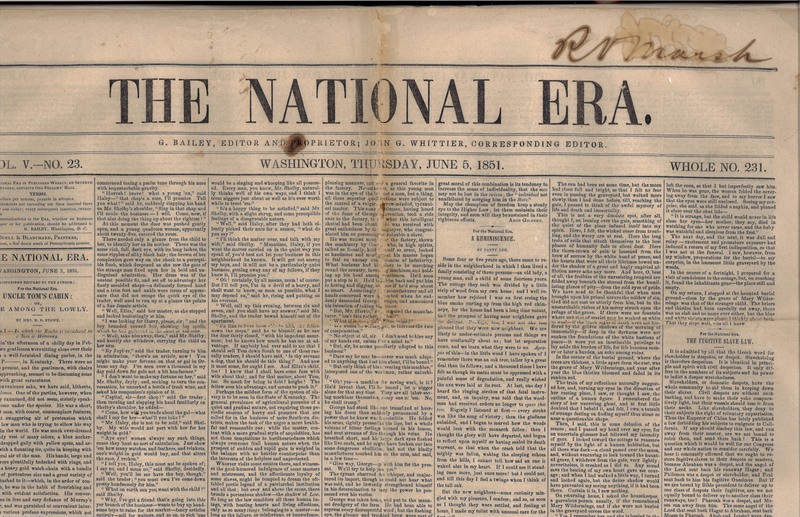 In 1851, Stowe offered the publisher of the abolitionist newspaper The National Era a piece that would “paint a word picture of slavery.” Stowe expected to write three or four installments, but Uncle Tom’s Cabin grew to more than 40. In 1852, the serial was published as a two-volume book. Uncle Tom’s Cabin was a runaway best-seller, selling 10,000 copies in the United States in its first week; 300,000 in the first year; and in Great Britain, 1.5 million copies in one year. In the 19th century, the only book to outsell Uncle Tom’s Cabin was the Bible. More than 160 years after its publication, Uncle Tom’s Cabin has been translated into more than 70 languages and is known throughout the world. Read more about the impact of Uncle Tom’s Cabin. How Did Stowe Know About Slavery? Since Connecticut was the last New England state to abolish slavery in 1848, Harriet could have been exposed to slavery as a child. Some of Harriet’s earliest memories were of two indentured African American women in her family household, and an African American woman employed by the family. As an adult, Harriet remembered how they comforted her after the loss of her mother. As a young woman living in Ohio, Harriet traveled to neighboring Kentucky, a state where slavery was legal. There she visited a plantation which would serve as inspiration for the Shelby Plantation in Uncle Tom’s Cabin. In Cincinnati, Harriet learned that even discussion of slavery could divide a community: most students at her father’s school, Lane Seminary, left in protest after anti-slavery debates and societies were forbidden. Later, Stowe heard first-hand accounts from formerly enslaved people and employed at least one fugitive in her home. Her husband and brother helped sheltered a man and helped along the informal underground railroad. And she was appalled by the stories of cruel separations of mothers and children. As a woman who had lost her mother and one of her own children, Stowe felt a kinship with these women. As she began to write Uncle Tom’s Cabin, Stowe enlisted friends and family to send her information and scoured freedom narratives and anti-slavery newspapers for first-hand accounts. Why Did Stowe Write Uncle Tom's Cabin? crushing grief was incorporated into Uncle Tom’s Cabin; Stowe said it helped her understand the pain enslaved mothers felt when their children were sold away from them. Then, on September 18, 1850, the U.S. Congress passed the Compromise of 1850. Among its provisions was creation of the Fugitive Slave Law. Although helping those who escaped slavery had been illegal since 1793, the new law required that everyone, including ordinary citizens, help catch alleged fugitives. Those who aided escapees or refused to assist slave-catchers could be fined up to $1,000 and jailed for six months. After the law’s passage, anyone could be taken from the street, accused of being a fugitive from slavery, and taken before a federally appointed commissioner. The commissioner received $5 by ruling the suspected fugitive person was free, and $10 for ruling the person was “property” of an enslaver. The law clearly favored returning people to slavery. Free blacks and anti-slavery groups argued that the new law bribed commissioners to unjustly enslave kidnapped people. For more than 200 years, slavery had been common practice in the U.S. Enslaved African-Americans helped build the economic foundations of the new nation and were a driving force in the growing economy. Following the American Revolution, the new U.S. Constitution had tacitly acknowledged slavery, counting each enslaved person as three-fifths of a person for the purposes of taxation and Congressional representation. Abolitionist sentiment had provoked hostile responses north and south, including violent mobs, burning mailbags of abolitionist literature, and passage of a “gag rule” banning consideration of anti-slavery petitions in the U.S. House of Representatives. Despite the threat of violent persecution, and her expected role as a respectable woman, Stowe put pen to paper, illustrating slavery’s effect on families and helping readers empathize with enslaved characters. With the publication of Uncle Tom’s Cabin, critics charged that Stowe had made it all up and that slavery was a humane system. Stowe followed with a nonfiction retort, The Key to Uncle Tom’s Cabin (1853), compiling real-life evidence that had informed her novel. Stowe’s words changed the world, yet the issues she wrote about persist; her work provokes us to think and act on issues facing our world today. In Uncle Tom’s Cabin, Harriet Beecher Stowe shared ideas about the injustices of slavery, pushing back against dominant cultural beliefs about the physical and emotional capacities of black people. Stowe became a leading voice in the anti-slavery movement, and yet, her ideas about race were complicated. In letters to friends and family members, Stowe demonstrated that she did not believe in racial equality; she suggested, for example, that emancipated slaves should be sent to Africa, and she used derogatory language when describing black servants. Even in Uncle Tom’s Cabin, Stowe drew on popular and deeply offensive racial stereotypes when describing some of her characters. Though these beliefs seem to contradict Stowe’s commitment to anti-slavery, many white abolitionists believed that slavery was unjust while also believing that white people were intellectually, physically, and spiritually superior to black people. Other readers questioned Stowe’s authority to write Uncle Tom’s Cabin. She was a Northern white woman writing an exposé of slavery, and people from the 19th century until today have questioned whether she had the ability or right to speak for people of African descent. Though Stowe was earnest in her attempts to portray slavery as it really was—gathering an impressive array of facts, figures, and first-person testimonies to supplement her own observations—she would not have had the same insight or understanding as an enslaved person experiencing those conditions. Her reliance on racial stereotypes exposed her misconceptions about black people, discrediting her authority even more. Stowe’s position as a white author meant that she had access to larger audiences, and so, even though some doubted her perspective, she was able to reach and influence more people with her powerful argument against slavery. Uncle Tom’s Cabin opens on the Shelby plantation in Kentucky as two enslaved people, Tom and 4-year old Harry, are sold to pay Shelby family debts. Developing two plot lines, the story focuses on Tom, a strong, religious man living with his wife and three young children, and Eliza, Harry’s mother. When the novel begins, Eliza’s husband George Harris, unaware of Harry’s danger, has already escaped, planning to later purchase his family’s freedom. To protect her son, Eliza runs away, making a dramatic escape over the frozen Ohio River with Harry in her arms. Eventually the Harris family is reunited and journeys north to Canada. Tom protects his family by choosing not to run away so the others may stay together. Upon being sold south, he meets Topsy, a young black girl whose mischievous behavior hides her pain; Eva, an angelic, young white girl who is wise beyond her years; charming, elegant but passive St. Clare, Eva’s father; and finally, cruel, violent Simon Legree. Tom’s faith gives him the strength which carries him through years of suffering. The novel ends when both Tom and Eliza escape slavery: Eliza and her family reach Canada, but Tom’s freedom only comes in death. Simon Legree has Tom whipped to death for refusing to deny his faith or betray the hiding place of two fugitive women.